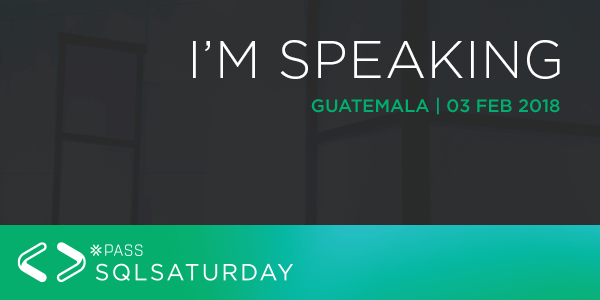 I’m very thrilled to announce that I will be participating as speaker in this year’s SQL Saturday event in Guatemala city! DMVs are the best source to conduct an advance troubleshooting of a SQL Server instance. In this session we will show how to use and the most important to understand the information provided by the Dynamic Management Views (DMVs). This session is about the importance of conducting regular health checks on your SQL Server instances to ensure that they are currently healthy, and continue to remain healthy. Join me in this deep dive discussion of SQL Server best practices and guidelines about your SQL Server health. What is a SQL Server health check? Why we should perform a SQL Server health check regularly? What tools we can use to perform a SQL Server health check? This entry was posted in Career, Conferences, PASS and tagged Career, Conferences, Guatemala, LATAM, PASS, Speaking, SQL Saturday, SQL Server on 01/04/2018 by DBA Master.